Can’t make up your mind whether you want pizza or spaghetti? Have both! 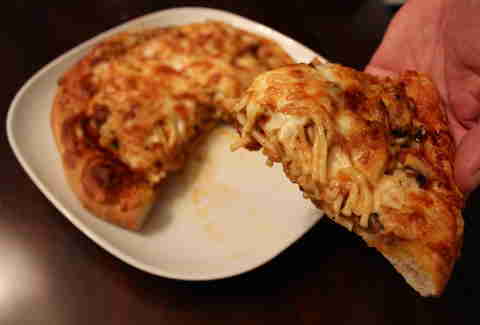 We invented the “pizza-ghetti” (you are welcome), a dish that would horrify any Italians. Typically served side by side on a plate, Marconi Pizzeria has reached a whole new level of culinary greatness by making a pizza with spaghetti on it. This artisan bakery from the municipality of Dunham specializes in traditional Québécois recipes and has a satellite shop in Marché Jean-Talon. On your way to your friend’s dinner? 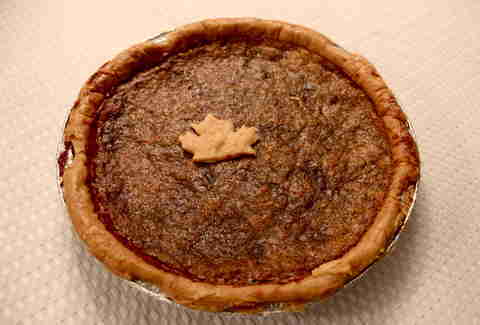 Bring dessert and grab the bakery’s maple pie. 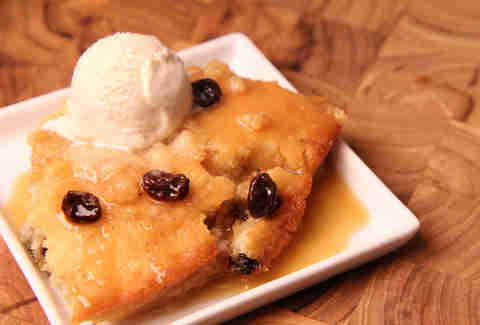 Watch as everyone says it’s “way too sweet” but eats it all anyway. 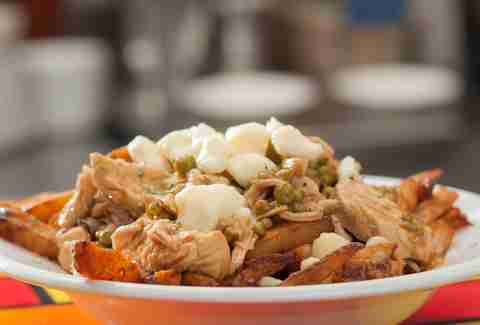 For over 45 years, this neighbourhood restaurant has served up one of the best poutines in town, such as the “Galvaude”, topped with chicken and peas, which is almost a hot chicken poutine. 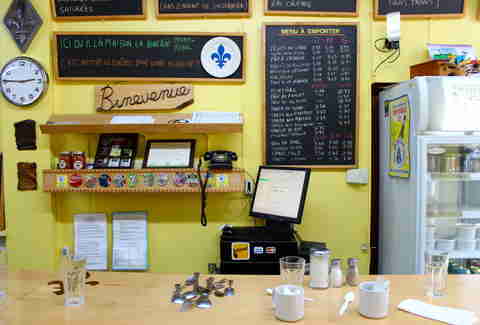 A Montreal institution, La Binerie is where you go eat “fèves au lard” or baked beans, a staple of the Québécois breakfast. Get the “Assiette Québécoise” to taste a sample of many traditional foods like pea soup, “tourtière” (meat pie) and “ragout de boulettes” (meatball ragout), too. You might want to go have a nap after that. 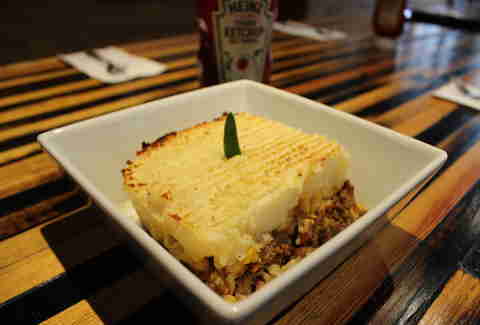 The myth goes that this classic Québécois dish known as “pâté chinois” (literally “Chinese pie”) was introduced to Canadian railway workers by Chinese cooks way back when Canada was a big wild piece of land. The layers of ground beef with diced onions, canned corn, and mashed potatoes -- in that order -- survived many generations and Mâche does it best. Mix it with a ton of ketchup and voilà. 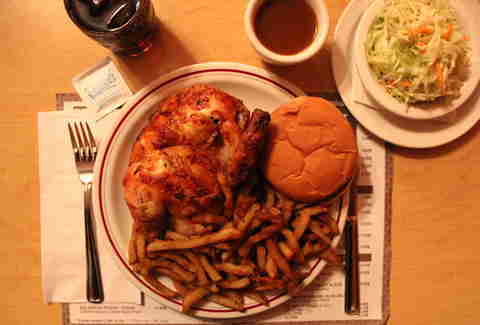 Forget the omnipresent chain St-Hubert BBQ and head to NDG for the best Québec-style BBQ chicken in town. Québec-style? That’s roasted chicken, fries, our special BBQ sauce, a side of slaw, and a hamburger bun. FYI, the bun is a vessel. You dip it in the sauce. It’s our way to drink BBQ sauce in a socially acceptable manner. 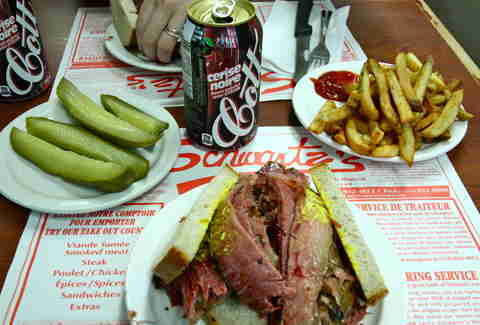 There’s a permanent line outdoors at this legendary delicatessen, but it’s all worth the wait because you haven’t had smoked meat before you had Schwartz’s. 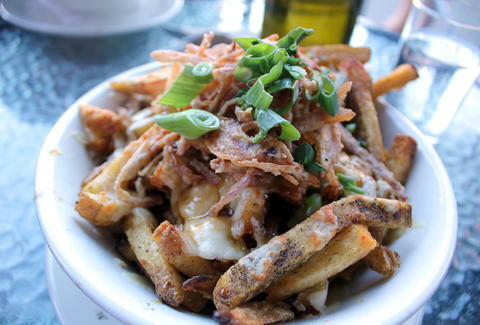 Get a side of fries, a smoked meat sandwich (ask for lean meat, there’s no reason not to, really), and wash it down with a Black Cherry Cott like many, many people before you. 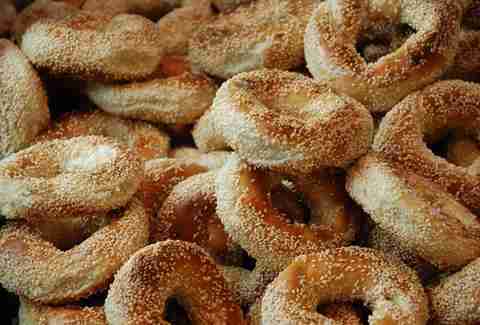 Unlike poutine, which we don’t really eat all that often, bagels are an integral part of our locals’ daily diets. Neighbouring 24-hour bagel institutions, Fairmount and St-Viateur, divide the city over which one makes the best. Grab a Liberty cream cheese (not Philadelphia) and throw an all-dressed bagel into the mix. It could change your life. Decadent celebrity Chef Martin Picard, famous for all things meaty and over the top (his “Squirrel Sushi” and beaver recipes once shocked the nation), serves the best “poor man’s pudding”, aka pouding chômeur, in town. A must. Reservations recommended. We steam our hot dog sausages and buns around here. A 75-year-old operation, Chez Ma Tante has perfected the art of the “steamé”, so order them all-dressed (relish, mustard, onions, and cabbage) and sprinkle some paprika on it. Something about their Shopsy’s wieners makes this place stand out from the rest.